The Qwicksilver Precious Metal Cleaning Plate does your work in seconds - no rubbing or polishing, no filthy hands and cloths. It's the only totally non-abrasive cleaner, making it ideal for precious metal restoration and maintenance. Qwicksilver cleans under hot water in your sink - wherever water flows, it cleans. 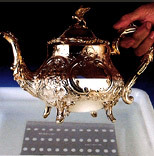 It even cleans difficult crevices clogged with the residue of old cleaners and into intricate and delicate settings, cleaning silver jewellery, gold, bronze and other valuables safely - even irreplaceable rare coins. It will not harm your hands, possessions or the environment. No abrasive chemicals are used in the process so there are no lingering smells. Cutlery and serving pieces are instantly table-ready. 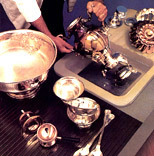 Qwicksilver cleans many items at once, for example 30 - 40 pieces of cutlery in your sink. It cleans large items that cannot totally fit in the sink: simply rotate your candelabra, teapot or copper bucket while it's in contact with the Qwicksilver plate under the water. Qwicksilver cleans jewellery to sparkling perfection as water gently cleans into the finest chain links and even behind complicated settings of stones without loosening them as sonic cleaners can. It is quite harmless to precious stones, brightening them as never before. No other tarnish remover restores jewellery and rare coins as safely as Qwicksilver. Your Qwicksilver Electrolytic Metal Cleaning Plate lasts for years. Just rinse the loose tarnish from your plate, dry it and it's ready for use over and over again. 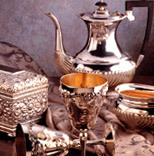 It is the lifetime answer to precious metal recovery and conservation. See for yourself how quick and easy it is to use the Qwicksilver. Qwicksilver, the ultimate non-abrasive gold, silver, jewellery, copper & brass cleaner used by millions worldwide for precious metal restoration.